Taking care of your Emperor Angelfish often requires a lot of patience and commitment because the most difficult thing to ensure their survival is to fulfill their requirement on the right diet. This is basically important because if not, the color will become off and you will notice your pet will lie still and becoming less active. A healthy emperor angelfish usually swims around actively and also enthusiastically looking around for foods. Basically their favorite diet comprises mainly algae and sponges which they love the most. Algae is readily available for your fish to feed on if you have a healthy population of reef and live rock. In order to make sure that you have enough supply of food, do not overstock the aquarium and if possible use the best aquarium lighting to ensure that the algae thrive and then regenerate enough for your emperor angelfish to survive. If possible maintain the right amount of live rock, which should be 1.5 pounds per gallon of water available in your fish tank. 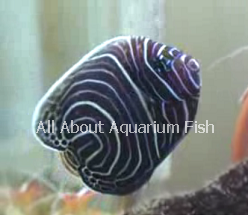 Usually hobbyist nowadays prefer to buy a juvenile fish because it is easier to make them adapt to current water condition and living environment. Don’t worry about color appearance because the juvenile angelfish looks as stunning comparable to the adult angelfish and generally the species can adapt well to the community aquarium comprises of tang, clownfish and even blennies. Based on my own experience, I find that there are more chances for them to join and adapt together with the rest of the species provided you introduce them as final addition. Sometimes, on odd circumstances they can become aggressive and if you observe that they keep on pestering the rest, then you should take measures to stop this. I had an experience with mine because few years ago, the first emperor angelfish that I’ve bought did not get along well with other tank mates and I have to head back again to the aquarium store to change to another emperor angelfish. Luckily the second one blends in well with the rest of my tropical tank species. A mature emperor angelfish can grow up to 1 feet in length provided that you vary their diet to include shrimp, krill and other small invertebrates. Other aspects like water quality can be improved by equipping your tank with UV sterilizer and protein skimmer while the best tank set up should be as large as possible (something like 120 gallon and above). Nowadays, it’s quite rare to see the fish being sold in pet stores but if I ever find one I wouldn’t miss the chance to consider getting one of this fish as addition to my new tank. Is it possible to use natural seawater for saltwater fish tank?